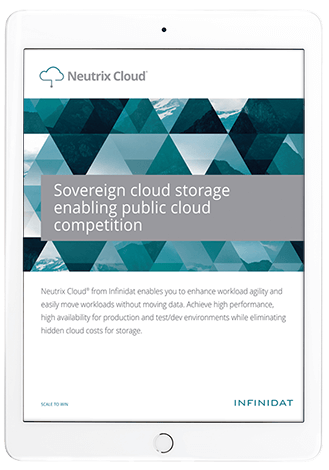 Neutrix Cloud® storage service from Infinidat elevates your data from the walled gardens of individual public clouds, so you can run your workloads where they make most sense without economic penalties or data gravity slowing you down. Subscribers to Neutrix Cloud benefit from proven Infinidat values, including built-in replication with on-premises InfiniBox infrastructure, cross-region replication, incredibly scalable snapshots that make test/dev environments easy and fast, and a 5x9s committed availability SLA underpinned by 7x9s backend storage infrastructure. Neutrix delivers InfiniBox® technology, without the box. 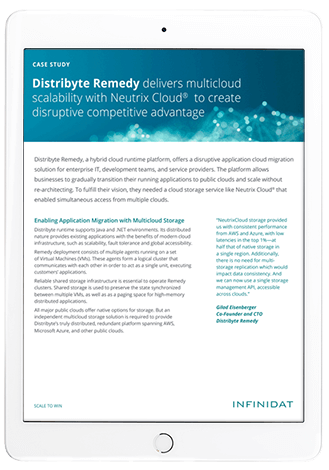 Download the Neutrix Cloud data sheet to learn more or click here to get started today. With Neutrix Cloud, it is easier than ever to consolidate your cloud storage and provide simultaneous access to multiple public cloud services. Run enterprise applications natively in your favorite compute provider while utilizing adjacent enterprise-class storage. If your favorite compute cloud changes, then you simply add network connections - no need to move the backend data. InfiniBox® owners can also efficiently use Neutrix Cloud as the target for replication to simplify their journey to the public clouds or as an implementation of disaster recovery as a service. Neutrix Cloud allows you to have the public clouds compete for your compute workloads, without having to worry about which cloud your data is locked into. You can leverage spot pricing for app instances across clouds without moving your data. Reduce costly egress fees and synchronization challenges when using the same data in multiple clouds. You can spin up snapshots for test/dev instances of your cloud scale applications without having to purchase more storage. At 9¢/GB/month, Neutrix Cloud is a sound economic choice. Advanced snapshot capabilities, part of the Infinidat software architecture, support your cloud-scale application development and deployment at multi-petabyte scale. Native replication with on-premises InfiniBox environments provides an easy path to public cloud, or just a simple disaster recovery solution as a service. Enjoy all the features and benefits of enterprise storage, without owning the box. Download the Distribyte Remedy case study to learn more. Neutrix Cloud is built to deliver high availability orders of magnitude beyond the three or four nines availability SLAs typically found in public cloud storage today. Neutrix Cloud storage services are backed with an industry-leading five-nines availability SLA and 24x7 support included in the monthly price. Neutrix Cloud backend systems share the trusted seven-nines (99.99999%) InfiniBox architecture, to support enterprise-grade workloads. Using the Infinidat technology foundation, including InfiniRaid®, your data is also proactively secured and continuously checked to ensure the highest levels of data reliability. Neutrix Cloud is designed to be as easy to use as on-premises storage, employing the same style of GUI, RESTful API, and CLI as the award-winning InfiniBox family of enterprise storage solutions. No longer will you have to learn multiple storage APIs when one central cloud storage service can handle all your workloads while maintaining your data’s sovereignty. 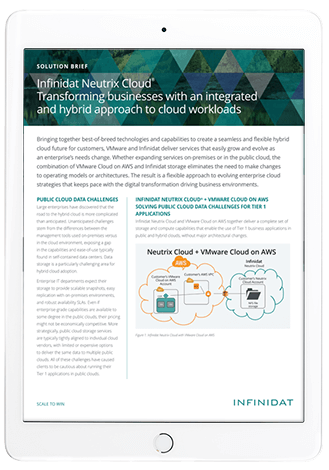 Download the Neutrix Cloud solution brief to learn more. 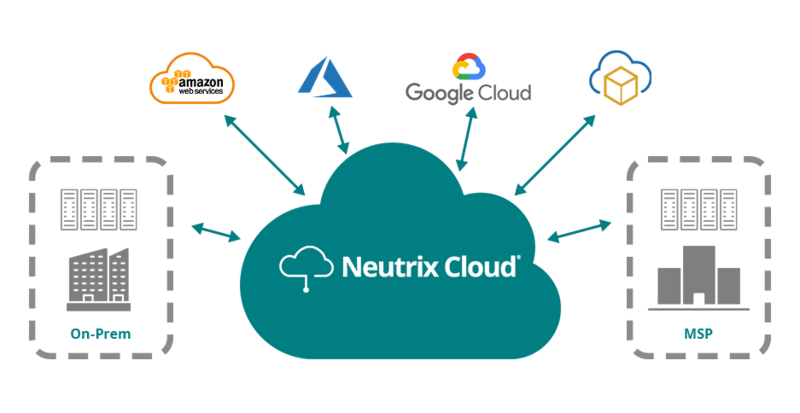 Neutrix Cloud enables you to maintain better control of your data, reduce your risk of public cloud lock-in, and lower your cloud storage expenses. Want to get started with Neutrix Cloud? Click through to the form below to submit an onboarding request or a POC request.